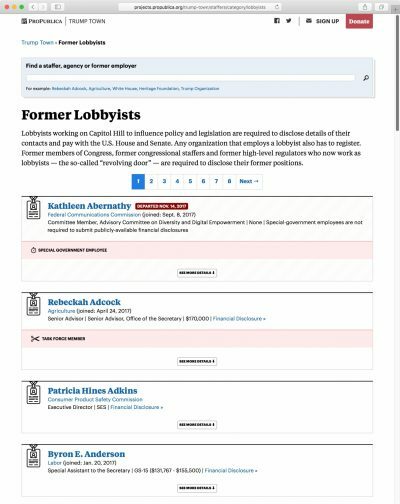 We found 187 former lobbyists who work in the Trump administration. Drilling down even further, at least 35 Trump political appointees worked for or consulted with groups affiliated with the the billionaire libertarian brothers Charles and David Koch, who also have a network of advocacy groups, nonprofits, private companies and political action committees. At least 25 Trump appointees came from the influential Heritage Foundation, a conservative think tank founded in 1973, and at least two came from Heritage Action, its related political nonprofit. Heritage says the Trump administration, in just its first year, has enacted nearly two-thirds of its 334 policy recommendations. We also found — for the first time — dozens of special-government employees, or SGEs, who work as paid consultants or experts for federal agencies while keeping their day jobs in the private sector. This rare government gig allows them to legally work for both industry and the Trump administration at the same time. Under the Obama administration, Huma Abedin, the longtime aide to former Secretary of State Hillary Clinton, benefited from this policy while simultaneously working at the State Department, the Clinton Foundation and a corporate consulting firm, drawing scrutiny from the Senate Judiciary Committee and the Government Accountability Office. Roughly 60 percent of the Trump administration officials included in our analysis have financial disclosure reports. We have requested these reports for the rest. Since our last update of financial disclosure records in August, we have added 660 such reports from across the government. SGEs are paid consultants or experts for federal agencies while keeping their day jobs in the private sector. 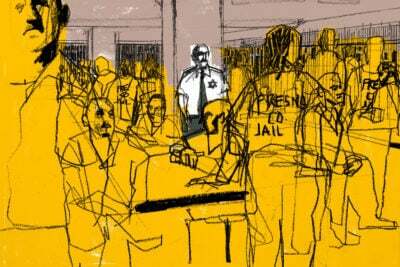 We also did a more limited version of this project in 2009, at the start of the Obama administration. As part of this year’s analysis, we compared the number of appointees in the first year of both the Obama and Trump administrations who had been active lobbyists in the two years prior to their nomination for Senate-confirmed government jobs. Even though the Trump administration has lagged significantly behind previous administrations in appointing people for such positions, more Trump appointees were recent lobbyists than Obama appointees: Trump had 18 in his first year, while Obama had 14. “Focusing on novel scandals alone can distract from the enormous scale of the Trump administration’s embrace of revolving-door hiring,” said Jeff Hauser, executive director of the Revolving Door Project at the nonpartisan Center for Economic and Policy Research. The pipelines between conservative policy think tanks — namely the Heritage Foundation and the Koch Brothers’ Freedom Partners Chamber of Commerce — and the Trump administration are clear, as is their effect on federal policy. 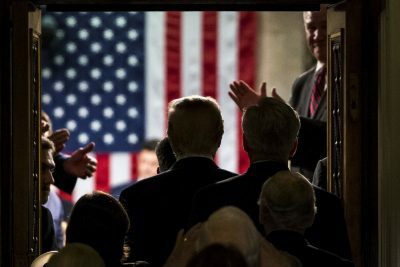 Just before Trump took office last January, Freedom Partners Chamber of Commerce, one of the main conservative advocacy groups funded by the Koch Brothers, unveiled a deregulatory wish list. The action plan highlighted 19 Obama-era policies affecting the environment, labor and technology that Freedom Partners wanted gone. “This strategy can help to unravel eight years of regulatory overreach starting immediately,” the organization’s vice president, Andy Koenig, wrote in an accompanying press release. 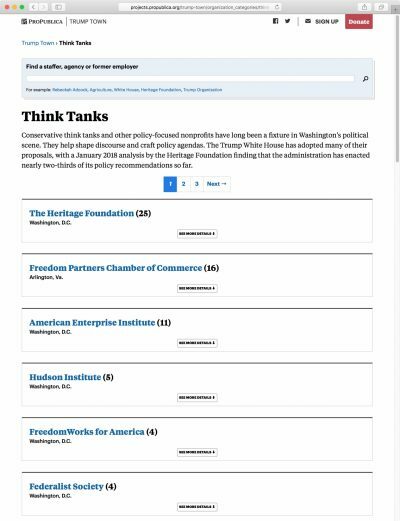 125 appointees in our database formerly worked at conservative think tanks. A few weeks later, Koenig joined the White House as a policy assistant, putting him in a position to implement his former employer’s agenda. Sure enough, just over a year later, the administration has acted on 16 of the 19 suggestions that Freedom Partners listed. The moratorium on federal coal leases? Lifted. The Paris climate agreement? Withdrawn. The Clean Power Plan? Repealed. The FCC’s net neutrality policy, the EPA’s Waters of the United States rule, and the Consumer Financial Protection Bureau’s arbitration rules? All reversed. Freedom Partners and the White House didn’t respond to requests for comment. The Heritage Foundation has touted its influence over Trump’s agenda. On Jan. 23, the organization said the Trump administration embraced two-thirds of the 334 policy recommendations in its “Mandate for Leadership,” such as shrinking national monuments in Utah, preventing taxpayer funding for international groups involved in abortion (known as the Mexico City Policy), raising military spending, and withdrawing from UNESCO. Heritage cited the efforts of about 70 of its former employees working throughout the transition and administration. Our analysis found 28 officials who used to work at the Heritage Foundation and its advocacy arm, Heritage Action. We assembled an authoritative database of the people appointed to government positions by the Trump administration. Here’s how we did it. Not all political appointments are announced. 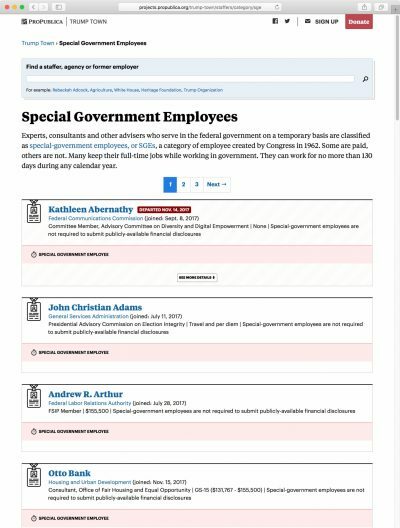 In digging through lists of special-government employees, we found several in key positions in the Trump administration, including Wendy Teramoto, Commerce Secretary Wilbur Ross’s chief of staff and a longtime aide at his private equity firm; James D. Ray, a George W. Bush-era staffer who worked as an unpaid consultant at the Department of Transportation while keeping his job as a principal in KPMG’s infrastructure consulting practice; and Leonard Wolfson, who was lobbying on behalf of the Mortgage Bankers Association on Capitol Hill one week before getting paid $64 per hour as an expert at the Department of Housing and Urban Development the next week. Wolfson’s case is a prime example of the inherent business conflicts in such arrangements: Wolfson is a well-known housing lobbyist among House Republicans and served in the Bush administration at HUD from 2005 to 2008. Senate records show Wolfson was actively lobbying on banking legislation and regulatory issues in April and May. By mid-May, Wolfson had taken a relatively rare position as an outside “expert” at HUD while he was still employed at the 2,200-member lobbying group. To take the HUD gig, Wolfson took an unpaid leave from the Mortgage Bankers Association. He didn’t fully resign from the group until July 31. At HUD, Wolfson worked on getting nominees for senior positions at the agency through the backlogged and slow Senate confirmation process, according to HUD officials. His paid government consulting work this past summer was not previously disclosed. And in December, Wolfson himself was appointed and confirmed as HUD’s assistant secretary for congressional and intergovernmental relations. 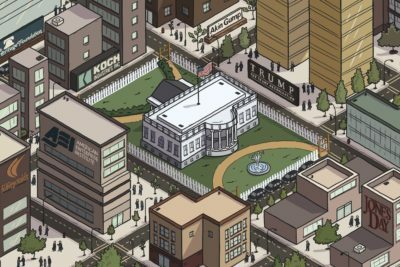 We’re releasing Trump Town as a resource for journalists, researchers and the public. Its goal: to increase understanding of who the current administration’s taxpayer-funded decision-makers are and how their work histories and financial holdings might influence public policy.